Iams ProActive Health Adult Hairball cat food is a complete and balanced maintenance cat food which includes beet pulp that helps reduce the formation of hairballs by gently carrying the hair through the digestive tract. Tailored to adult cats over 1 year old, it contains the best fibre source which promotes a healthy gut and small stool volume, while helping to maintain urinary tract health. Other benefits include helping to maintain a healthy skin and coat as it contains a balance of Omega-6 to Omega-3 fatty acids. Dried Chicken And Turkey (40%, A Natural Source Of Taurine), Maize Grits, Maize, Animal Fat, Wheat, Dried Beet Pulp (6%), Dried Whole Egg, Hydrolysed Animal Proteins, Fructooligosaccharides (0.69%), Potassium Chloride, Brewer'S Dried Yeast, Fish Oil. Vitamin A (85845 Iu/Kg), Vitamin D (6993 Iu/Kg), Vitamin E (150 Mg/Kg), Trace Elements: Cupric Sulphate Pentahydrate (37 Mg/Kg), Zinc Oxide (222 Mg/Kg), Manganous Sulphate Monohydrate (134 Mg/Kg), Potassium Iodide (1.6 Mg/Kg), Basic Cobaltous Carbonate Monhydrate (5.0 Mg/Kg). 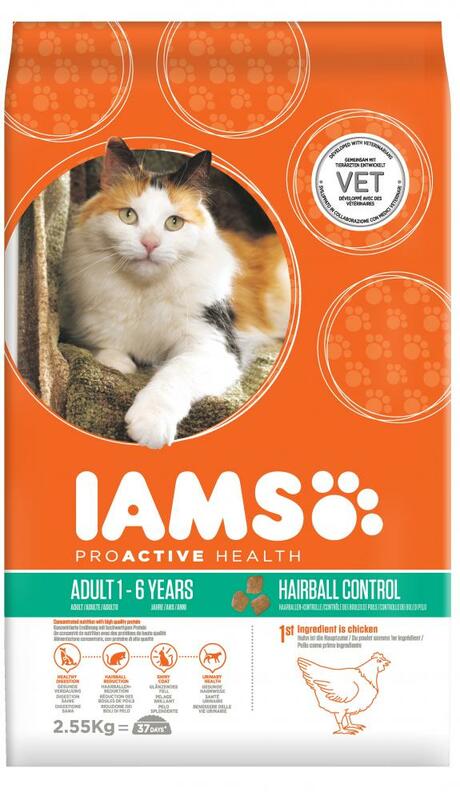 There are currently no questions for Iams Proactive Health Adult Hairball Chicken Cat Food - be the first to ask one!